We find ourselves, as we so often do, in the distant future. Someone has finally found the Mugunghwa, a South Korean generation ship that was lost in deep space centuries ago. 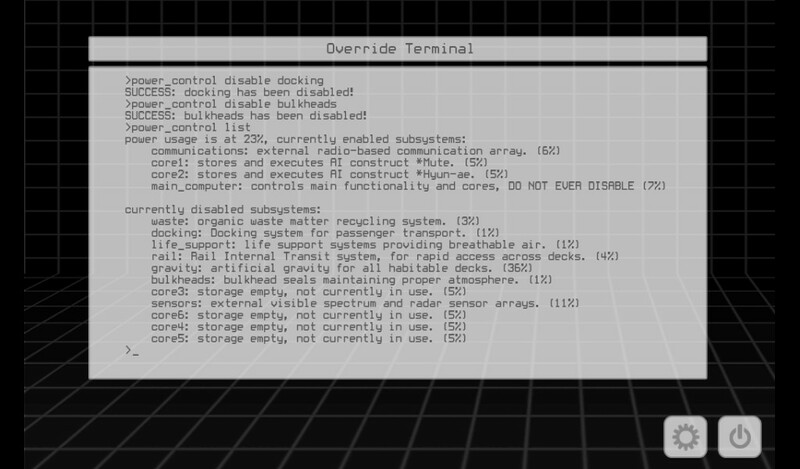 It’s floating lifelessly in orbit around an out of the way star, and you’ve been sent to figure out what happened. 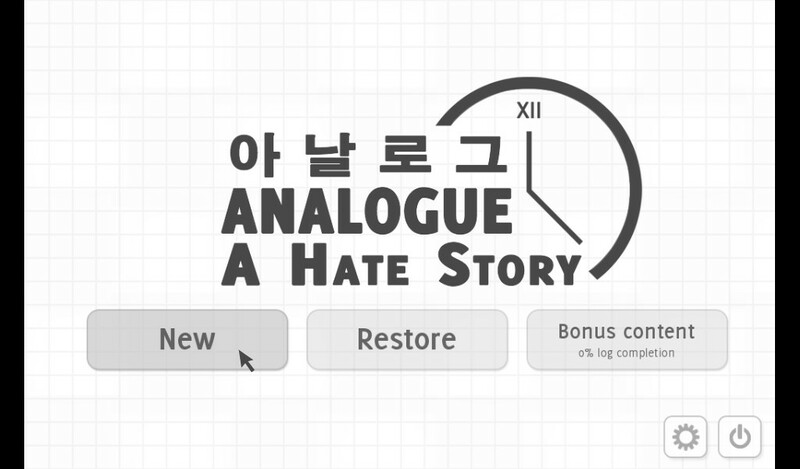 Now, normally this would be the setup for a surprise!-everyone-on-the-ship-died-and-is-now-a-zombie horror game, but Analogue: A Hate Story uses it as a setup for a game about being a space historian. Everyone on the ship died at the same time over six hundred years ago, leaving the spacecraft and its systems itself intact. 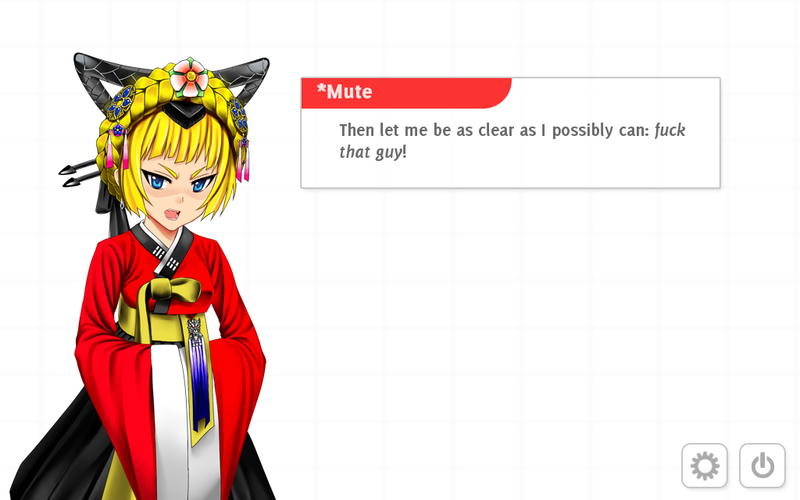 And with the help of a chirpy, talkative AI named *Hyun-ae, and later the security AI *Mute, you start reading through the ship’s logs to find out why. However, a convenient problem with the AI’s interfaces means that while you can see and hear them, they can’t see or hear you. As such, your only means of direct communication is choosing between the binary conversation options they occasionally present you with. The rest of the time, barring a couple of puzzley forays into the ship’s override terminal, you’ll be working your way through the letters and diary entries of some of the most important people in the ship’s last days, including members of the ship’s three most powerful families – the Kims, the Smiths, and the royal Ryu dynasty. Bit by bit the things you read allow you to make sense of not just how they died, but how they lived before the fall. It soon becomes clear that the Mugunghwa underwent some radical cultural changes during the its centuries-long journey, eventually regressing into an intensely patriarchal, honour-obsessed society more reminiscent of the Joseon Korean dynasty than an advanced spacefaring civilisation. And while you may initially only be interested in solving the grand mystery of how everyone on the ship came to die, the stories of how they lived – how this oppressive culture operated, and the the situations it forced people into – are just as interesting. Most of the files you read are concern with the ordinary lives of the nobility – the rivalries, the political manoeuvrings, and the desperate keeping up of appearances – but your reading often won’t paint any single, consistent picture. The people writing these files aren’t always reliable. They all have their own idiosyncrasies and biases that affect both what they say, and how they say it. And after a little while you’ll start to understand the people behind the documents. 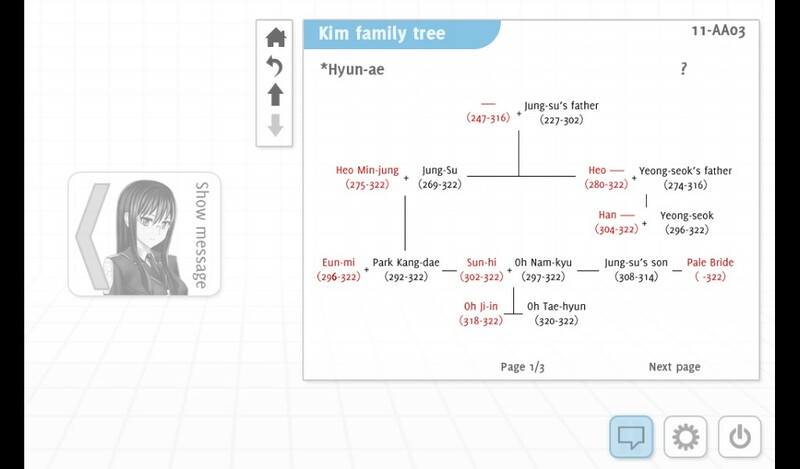 You’ll begin to make connections between events, recognise previously unfamiliar names on a family tree, and start filling in some of the blanks yourself. And as you learn about life on the Mugunghwa there’s a good chance you’ll get more and more disgusted with the things that took place there. We see intelligent, capable women systematically being pushed to the sidelines and ignored, or married off and expected to stay quiet for their husbands. They’re baby-makers or servants or prostitutes, and we see otherwise decent men and women embrace this way of life with a disturbing readiness. The stories you begin to uncover – the long-running feuds between the Kims and the Smiths, the mystery of the Pale Bride, a secret and dishonourable love – are invariably fascinating reading, shaped at all times as they are by the limitations and the harshness of the culture of the Mugunghwa‘s. And Christine Love (Analogue’s creator) has a real talent for speaking in the voices of the varied characters that make up these stories. The strong, rebellious women, the stony patriarchs, and everyone in between – all of them are believable, and understandable as human beings shaped by the wider cultural framework they inhabit. Many of them are horrendous people, but I found them so human – in many cases so pitiable – that I couldn’t bring myself to judge them. 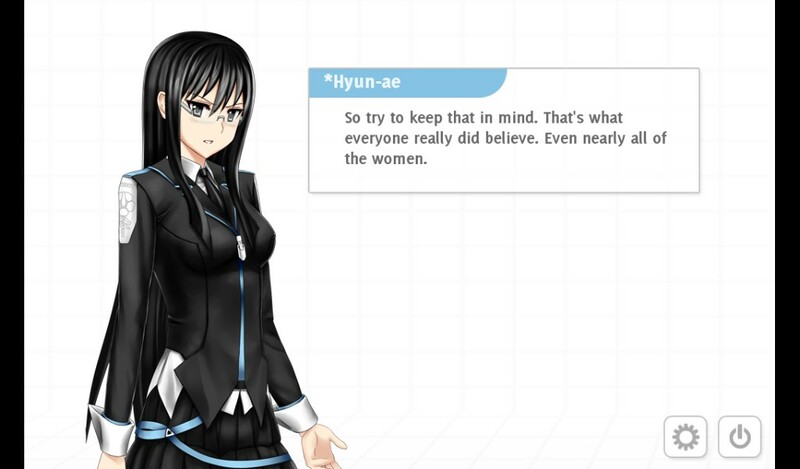 But while I may not have been able to pass judgement, the AI companions *Hyun-ae and *Mute are all to happy to react with strong judgements of their own. They take the stories you read and, by reacting to them, each casts them in a different light. The former has nothing but contempt for the culture and the people of the Mugunghwa, and the latter vociferously defends the status quo, including the way people were treated aboard the ship. And while mostly you’ll simply listen to what they have to say to you, the handful of times you’re allowed to respond feel extremely significant for the game as a whole. Your input in a heated, emotional moment, though limited to agreeing or disagreeing with something they’ve said, has a big impact on your relationship with the characters. These decisions can change how each character treats you, and will help determine which of the game’s five endings you eventually receive. Most importantly, it changes the tone of the game drastically. Agree with *Hyun-ae that someone should be pitied rather than vilified and you’ll feel her warming to you. Challenge *Mute’s deeply engrained prejudices, and her contempt for you will be palpable, especially if you have the temerity to have happened to play the game as a woman. Your actions can lead to an enduring feeling of camaraderie, or a grinding sense of tension that lasts for the rest of the game. You may not have a great deal of ability to direct the flow of the narrative, but your choices drastically alter the way to experience it, and that’s what’s so important about the choices you make. They’re not there, as some have suggested, to lift Analogue up from being ‘just’ a game about reading (as if that’s an inherently bad type of game). They’re there to give you the agency to express your opinion about what you’ve witnessed. And the opinions you offer – the judgements you make – radically affect how the game feels. It’s not really about traditional ‘choose path A or B’ branching narrative – though there is indeed some of that. What the game does is give you full control over how you experience the fairly linear path you’re given. The way you talk to the AIs, and which one you tend to listen to, changes how the game feels. And the way you approach the myriad of letters and diary entries you encounter has the same effect: you can blast through them looking to unravel the mysteries, or you can take your time and really try to understand the people you’re reading about. You can go back and forth between documents, building up a better and better picture of their lives, and coming to genuinely care about their stories. I could write entire essays about countless different aspects of Analogue. Its treatment of *Mute and *Hyun-ae. Or the impressive setpiece at the halfway mark. and the way it forces you to deal with the huge consequences of a potentially unwitting choice. Perhaps its position as a game that feels like doing the world’s best, most thrilling piece of historical research. Or how it relates to the classic science fiction of writers like Isaac Asimov and Daniel Keyes – science fiction that uses its unreal elements to tell a story about something very real, and very human. I’d certainly like to write some of those essays, but for now I’ll leave it with one last sentence to serve as a summary: it’s a vastly impressive game, for many different reasons, and it stands as one of the very best this year had to offer. 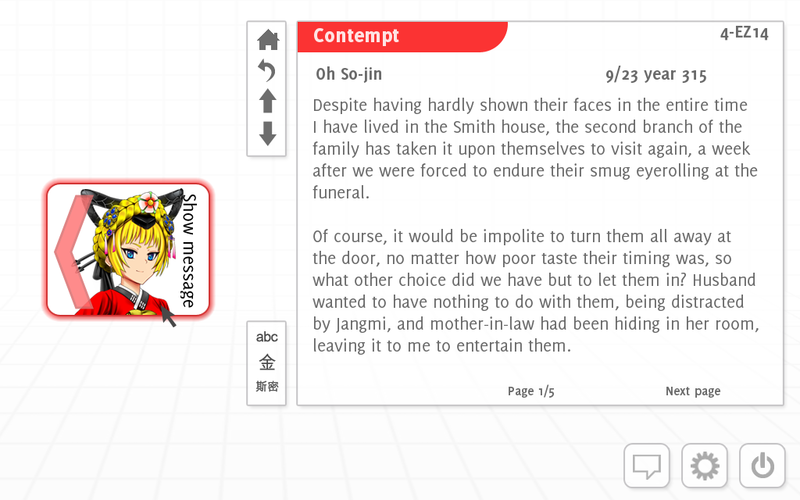 This entry was posted in Games Blather and tagged Analogue: A Hate Story, Christine Love, The Games of 2012. Bookmark the permalink.